Updated: June 6, 2016 at 7:33 a.m.
University President Steven Knapp’s compensation reached nearly $1.2 million in fiscal year 2015, a 7 percent increase from the year before. Knapp’s base salary in fiscal year 2015, excluding benefits and bonuses, was $873,191. It is the sixth year in a row that his base salary has risen, increasing by about five percent each year. The rise in Knapp’s compensation is largely due to an increase in his benefits and bonuses, which totaled more than $323,000. Knapp’s bonus package increased this year, after a 43-percent dip in fiscal year 2014. University spokeswoman Candace Smith said the increase was determined by the Board of Trustees’ compensation committee, which uses national data from other university presidents’ salaries to determine Knapp’s salary from year to year. Smith said the committee makes the decision by comparing GW to universities of similar sizes and reputations. “The committee obtains compensation information provided by an independent consulting firm that includes market data from comparable universities as appropriate for his skills and experience,” Smith said in an email. Knapp was the highest earning administrator, closely followed by Executive Vice President and Treasurer Lou Katz, who earned about $981,000. In fiscal year 2014, Knapp earned $1.12 million total – about 14 percent less than the previous year’s record-high $1.28 million. Mamie Voight, the vice president of policy research at the Institute for Higher Ed Policy, said compensation for university administrators has risen across the country, growing about 5.6 percent between 2012 and 2013. Experts told the Hatchet in 2014 that president’s increased compensations was inspired by growing salaries of chief executive officers at large companies. University presidents are paid to travel, fundraise and make executive decisions, like budget cuts. 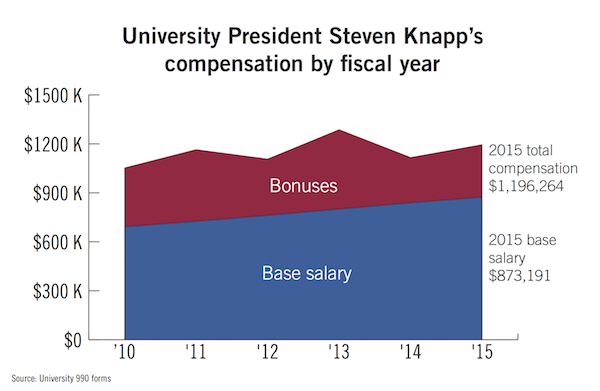 In the Chronicle of Higher Education’s report on “Executive Compensation at Private and Public Colleges,” which uses data from the 2013 calendar year, Knapp was listed as the 24th-highest-paid university president in the country. Jennifer Delaney, an associate professor of higher education at the University of Illinois at Urbana–Champaign, said administrators’ salaries are typically increasing faster than faculty salaries overall. The University raises faculty compensation by about three percent every year to keep up with inflation, but professors last year said their salaries lagged behind peer schools’ and national averages. Delaney added that the size of administrators’ bonuses and benefits may be determined by their performance in the role. She said it is impossible to know the exact nature of Knapp’s compensation changes without examining his contract, which might include specific achievement goals. University officials are currently conducting a review of Knapp’s progress as president as his contract is set to expire in 2017.